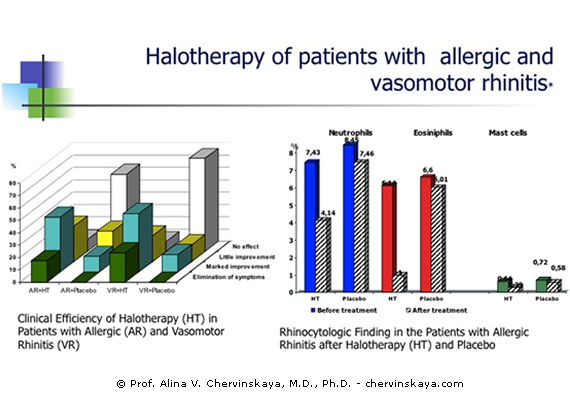 Clinical efficacy of Halotherapy | Prof. Alina V. Chervinskaya, M.D., Ph.D. Controlled placebo-studies shown that adding this method to the set of restorative treatment methods and rehabilitation of patients with chronic bronchopulmonary pathology in the phase of recovery and stabilization enables to achieve the best clinical effect with 82 – 96% of patients with the most appropriate doses of medication, and contribute to the improvement of the quality of life. 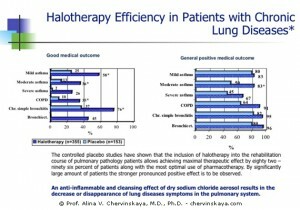 Halotherapy is useful in the rehabilitation of patients with acute pulmonary diseases with prolonged sluggish and inflammatory processes, typical for protracted acute bronchitis and pneumonia, chronic bronchitis, bronchiectasis, after surgery, etc. 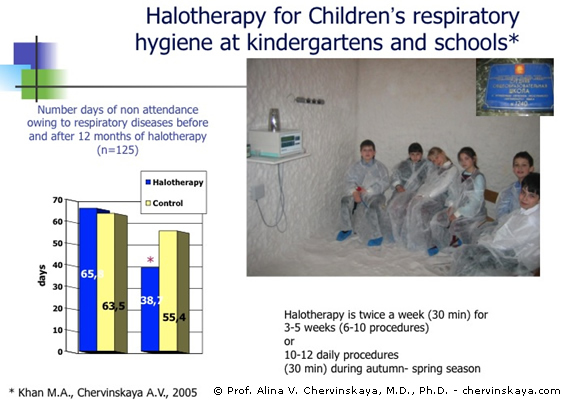 In pediatrics, Halotherapy is most commonly used for treatment and rehabilitation of children with asthma (efficiency 75-85%), high efficiency is also achieved in the treatment of kids with recurrent bronchitis, especially in cases of obstructive forms. 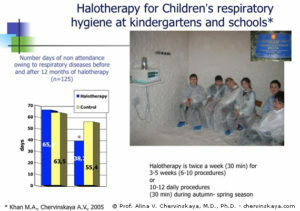 Therapeutic impact of Halotherapy enables a significant reduction of the prescription of antibacterial agents that help prevention of dysbacteriosis and allergic reactions with children. Halotherapy has a good track record as a method of prevention and rehabilitation for kids when used in pre-school and educational institutions. Prevention courses for frequently ill kids reduce the risk of recurrent disease by 1.5-2 fold and accelerate recovery. The use of preventive treatments for tobacco smokers and those with exogenous risk factors enable to restore mucociliary clearance, eliminates early manifestations of obstruction and restore protection for the respiratory tract. With only two weekly prevention courses of Halotherapy within three-month time-period, a 1.5-2 fold reduction of acute viral respiratory infections was achieved both with the pulmonary patients and relatively healthy persons, however, exposed to the development of COPD. 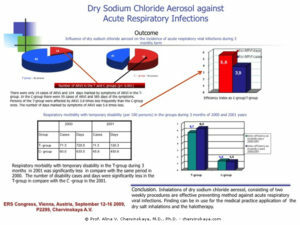 Application of unique salt aerosol concentration modes enables to apply HT not only for respiratory diseases but also for ENT-pathology, as well as in the field of dermatology. Controlled Halotherapy is advantageous for the treatment of skin diseases (atopic dermatitis, allergic dermatitis, eczema, psoriasis, etc.). Getting the Halotherapy treatments in modern salt rooms provides an affirmative cleaning action, restores skin biocenosis, enhance microcirculation, which is used in cosmetic applications. 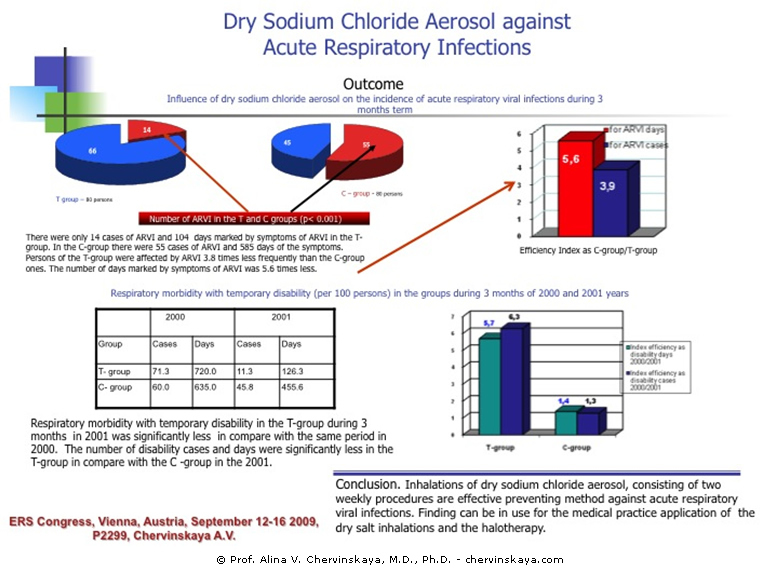 Dry sodium chloride aerosol provides a therapeutic anti-inflammatory, anti-edema impact on the mucosa of the pharynx, nose and paranasal sinuses in chronic pharyngitis, rhinitis, and sinusitis. Immunomodulatory effects of halo-aerosol in ENT-pathology is also proved. 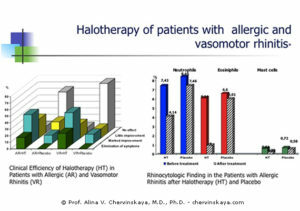 The use of Halotherapy as a method of conservative treatment of nose pathology diseases enables to achieve positive results in 72-87% cases with the highest efficiency for vasomotor and allergic rhinitis. The use of Halotherapy for many years, that has proved the safety of the method in terms of adverse effects on the cardiovascular system, enables the method to be applied for patients with COPD who have a concomitant cardiovascular disease, including the groups of aged people. 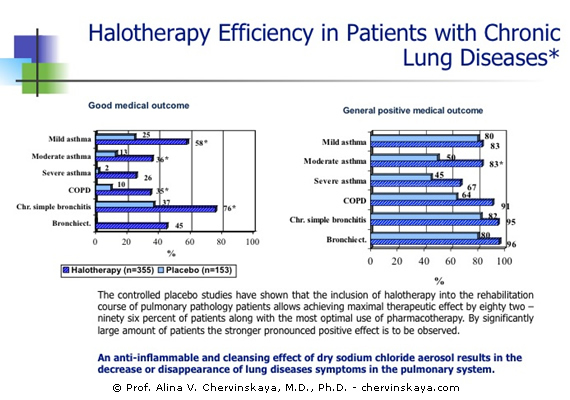 The use of Halotherapy for senior asthma and COPD patients (60+ years old) with coronary heart disease, dyscirculatory encephalopathy allowed to achieve a positive clinical effect in the absence of any adverse reactions. Clinical observation and experience of the Controlled Halotherapy application showed a favorable effect of Halotherapy on the cardiovascular system. Nowadays, the Controlled Halotherapy is added to the rehabilitation programs for patients with cardiovascular pathology.